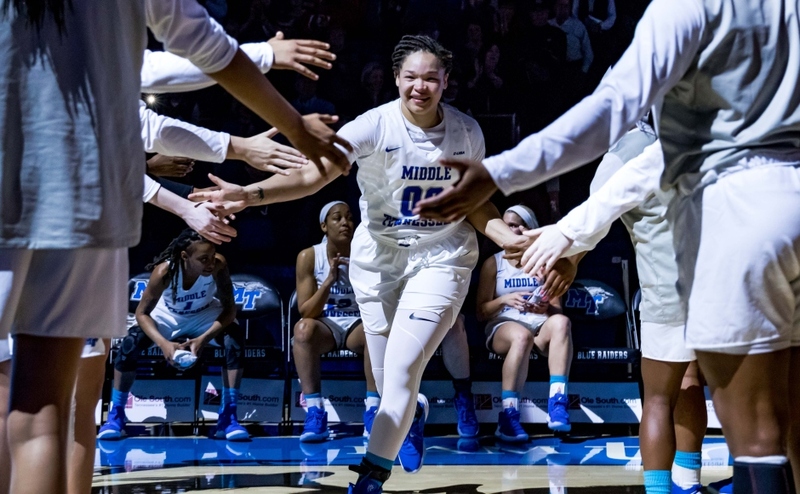 The Middle Tennessee Lady Raiders (18-10, 10-6) team secured the fourth overall seed in the upcoming Conference USA tournament after defeating the Old Dominion Monarchs (8-22, 6-10) by score of 65-47. It was a dominant showing for Middle, as they held the lead for the entirety of the game. 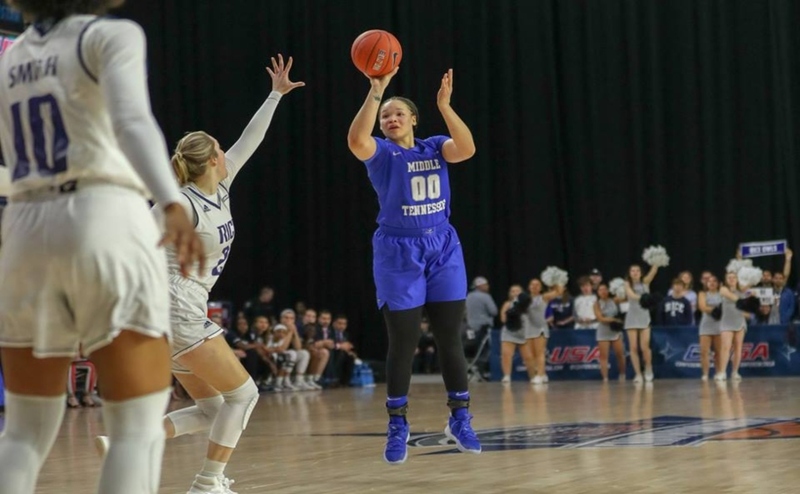 Senior forward Gabby Lyon established her presence on offense from the opening tip, when she knocked down a three-pointer on the team’s first possession. 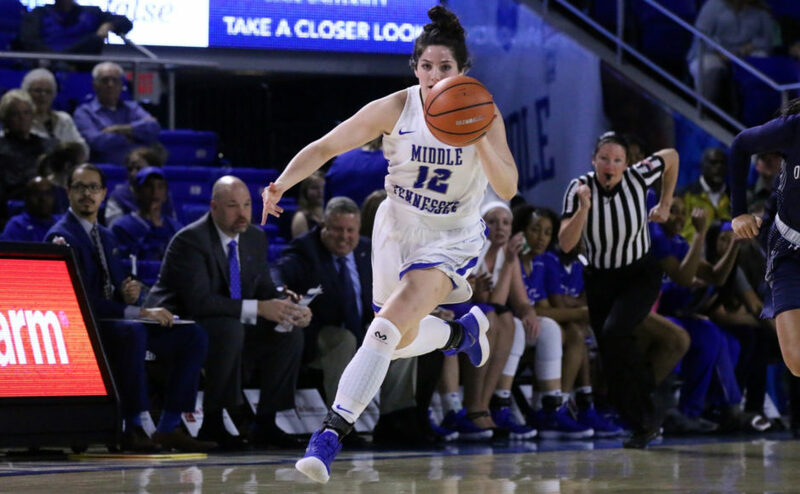 She scored the Lady Raiders’ first eight points to thrust MTSU to a 10-2 run to start the game. The Monarchs clawed their way back into contention however, as they used an 8-2 run to pull within two points. Late in the quarter, senior guard Abbey Sissom found the bottom of the net on a tough layup to give the Lady Raiders a 17-12 lead going into the second frame. In the second quarter, the Lady Raiders defense locked down and held the Monarchs to only seven points. 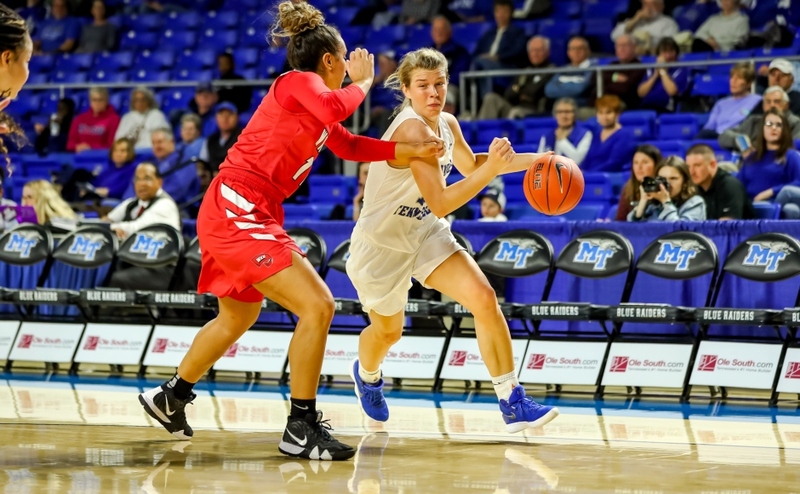 The tight defensive adjustments made by MTSU forced Old Dominion to take tough shots, as they made only three of their nine attempts. ODU was loose with the ball as well, as they committed seven turnovers that led to a 33-19 lead at halftime for the home team. The tables turned in the third quarter for MT. The Lady Raiders were plagued with a rough shooting quarter, as they made only three of their 12 field goal attempts. 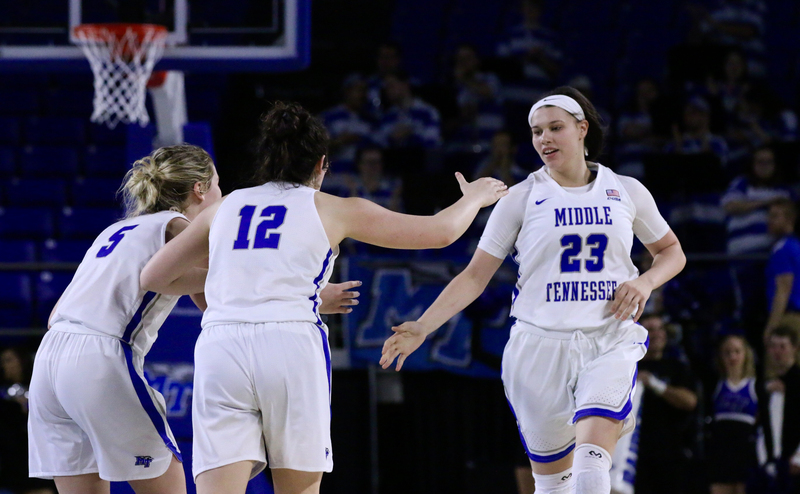 After the Monarchs cut the lead to five with three seconds remaining, junior forward Alex Johnson caught a full court pass from Lyon and proceeded to knock down a contested two-point jumper as time expired to give Middle Tennessee some momentum going into the fourth quarter. Despite the poor shooting quarter in the third, the Lady Raiders bounced back and pulled away late in the game. 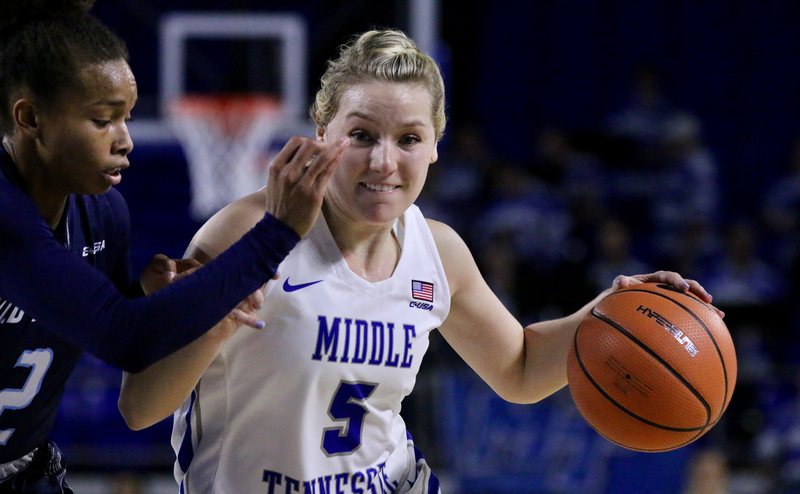 MT started the quarter on a 10-5 scoring run that was fueled by three-pointers by Johnson and freshman Anna Jones, as well as a pair of put-backs by Lyon. The offensive rebounding advantage and successful trips to the free throw line helped secure a 65-47 victory. 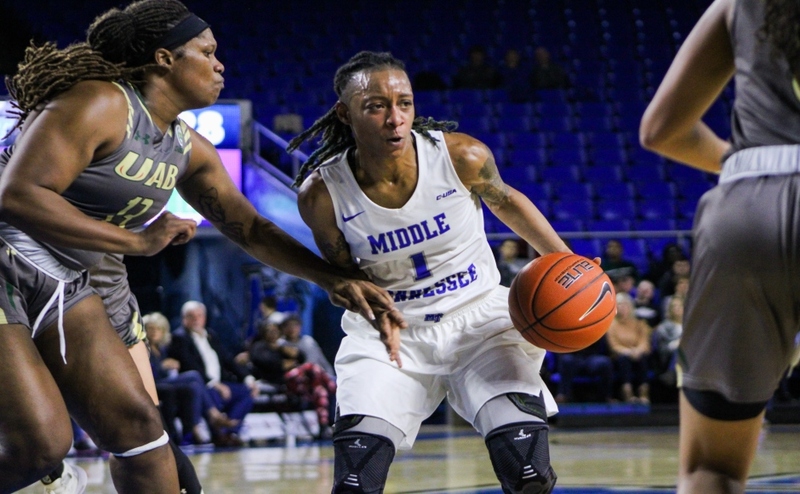 Johnson led the way for MTSU, as she scored 20 points on 5-8 shooting from the field and 9-11 shooting from the free throw line. 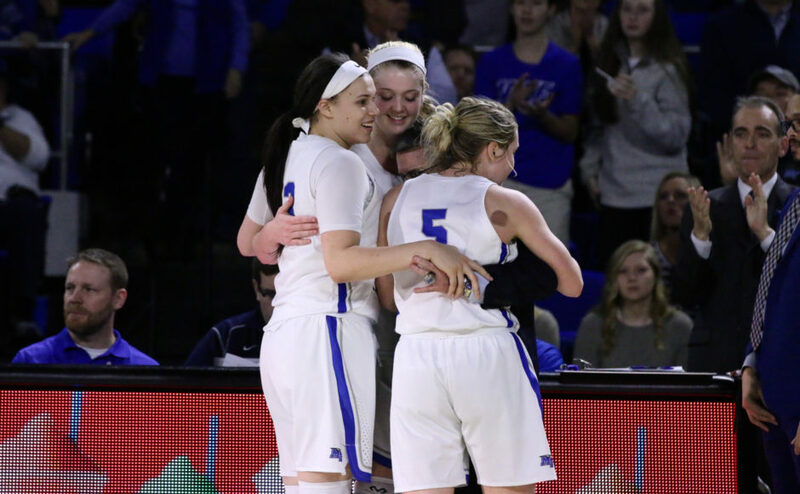 For these three seniors, their final game at the Glass House was a successful and emotional one. For Sissom, the emotions were heavy before she even stepped out onto the floor. 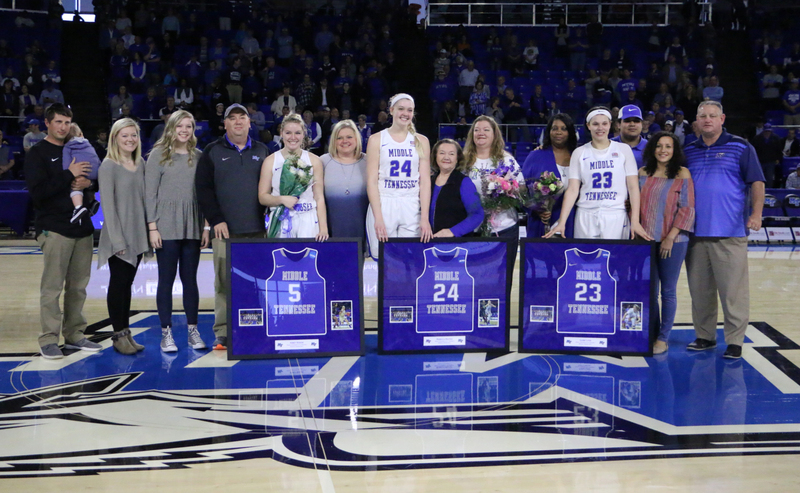 In their final game at Murphy Center, all three seniors posted solid outings. Lyon scored a career-high 16 points on 6-7 shooting. Reuter added nine points and eight rebounds, while Sissom scored 10 points and a team-high three assists. 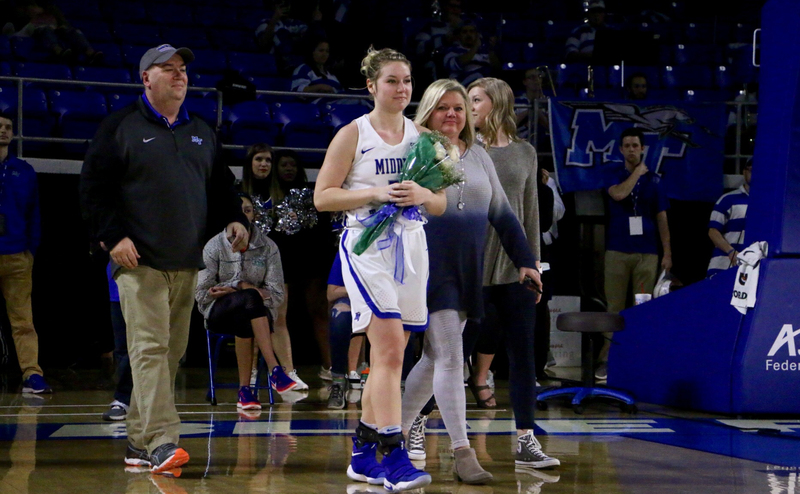 The most significant storyline for MT after the win on Saturday was the securing of the four-seed in next week’s C-USA tournament. In getting the fourth-seed, the Lady Raiders will have a first-round bye and only have to play three games at most in the tournament. 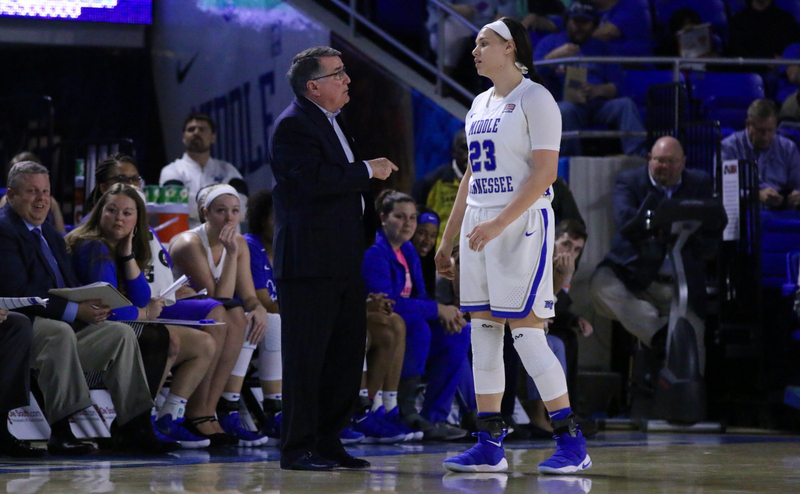 The Blue Raiders will travel to Frisco, Texas to participate in the C-USA tournament. MT will play their first round game on Thursday, Mar. 8 against the winner of Old Dominion and Rice.